I've learned so much from simplifying my closet and dressing with a small capsule wardrobe. While I've learned what best fits my body and my lifestyle, most of the lessons have nothing to do with clothing. Or, the lessons can be applied to clothes and life. A simpler closet is the gateway to a simpler life. I typically steer away from making recommendations on what you should wear, but feel strongly that none of us (at any age) need to wear these three things ever again. 1. Stop wearing the guilt of your past. Guilt and regret about the past aren't serving your present. In fact, because of that guilt, you aren't fully enjoying your current life. Whether it is guilt about letting go of something in your closet that you spent too much on, or guilt about a past relationship or anything in between, you have paid enough. You've paid with your money, time, attention and emotion. You can stop paying now. Let go, apologize, forgive and choose to live free of guilt and regret. 2. Stop wearing the pressure to prove yourself. I rarely bought clothes because I actually needed more clothes. I had plenty. Instead I purchased clothing to feel a certain way and to be perceived a certain way ... to prove myself. I wanted to feel smart, beautiful and loved. I wanted other people to think I was those things too. I tried to prove who I was by what I wore and by what I accomplished. The problem was that there was always more to prove and eventually I forgot who I was in the process. If you have to prove yourself to people you love, that isn't love. If you struggle to prove yourself at work, maybe you aren't doing the right work. If you don't believe me, just stop for a while. Stop pushing and proving and wishing that people would see you the way you think you need to be seen to succeed. Instead, let them see you for you. Once you stop proving yourself, you can be yourself. 3. Stop wearing the weight of other people's expectations and judgements. 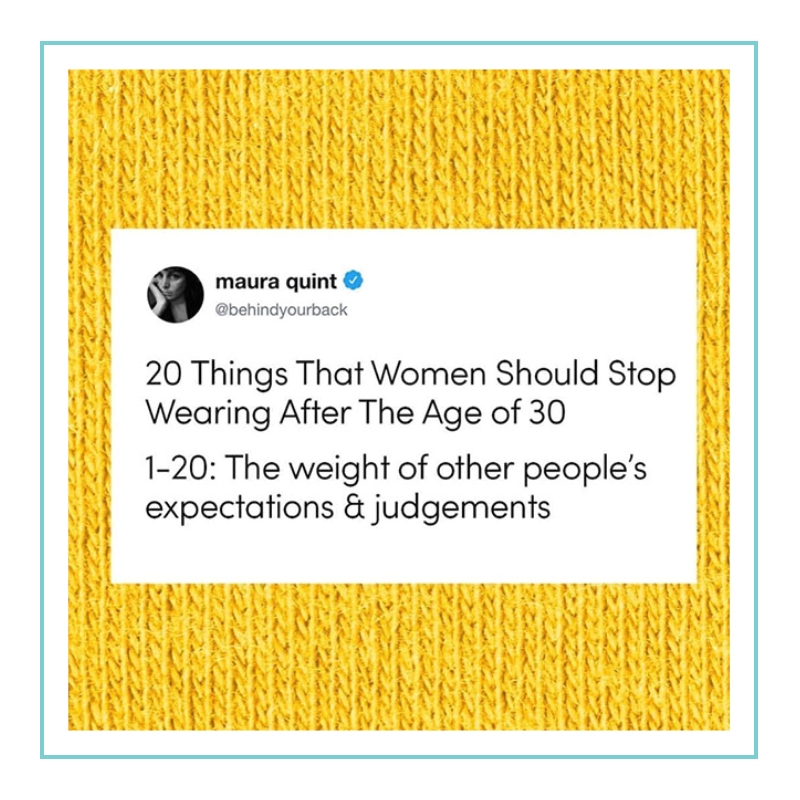 One of the most astounding realizations I made in the first three months of Project 333, dressing with 33 items or less, is that no one cared what I was wearing. No one even noticed! Why was I trying to please anyone with my clothing choices? Why was I trying to please anyone with my life choices? Giving myself permission to let go of my need to meet other people's expectations or to feel any kind of way based on judgements (good or bad) helps me to trust myself and allows me to love my life regardless of outside feedback. I'm not good or bad or right or wrong because of what anyone else thinks. I can't control what they think and I'm not going to change myself trying. It's a relief to know that I can love you and not care what you think about me at the same time. When you stop wearing the weight of other people's expectations and judgements, you'll be light. Wearing these things is wearing you down. You can stop now. Wear the clothes you want to wear. Live the life you want live. Be you. Be more with less is about simplifying your life and really living. Living with less creates time and space to discover what really matters. Through decluttering, and focusing on the best things instead of all the things, you can create a life with more savings and less no debt, more health and less stress, more space and less stuff, and more joy with less obligation. Courtney kindly granted us permission to share her wonderful blog with The Female CEO community - Thank you so much Courtney. You can read more about her and her truly inspiring journey here. You can also pick up a copy of her brilliant book (i’ve read it twice already) Soulful Simplicity.